It’s been said that memory is essential to our lives because it informs the present. 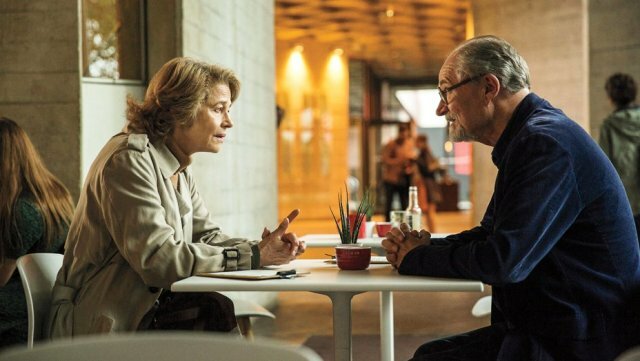 The film The Sense Of An Ending shows how it can sometimes resurrect itself and bite one squarely on the nether regions. This character-driven study in human relationships is an adaptation of the 2011 Man Booker Prize-winning novel of the same name by Julian Barnes. It centres on the recall of a 70-something curmudgeon Tony Webster (Jim Broadbent), a retired gent who now owns a camera shop in a north London borough. He’s divorced from his long-suffering wife Margaret (Harriet Walter) but he still maintains a friendly, if somewhat perfunctory relationship with her. They both dote on their pregnant daughter Susie (Michelle Dockery), who’s forging ahead with her plan to be a single mother while relying on physical and emotional help from her parents. Tony wanders through the motions of his life emotionally unscathed until, one day, he receives a letter from a solicitor to say that he’s been bequeathed a diary from a university girlfriend’s mother, Sarah Ford (Emily Mortimer), and he sets out to retrieve it from his dim-distant ex, Veronica (Charlotte Rampling). She, however, is just as determined to keep it from him. But why? What he finds causes Tony to examine his memory and re-evaluate all his presumptions as he relives the events of his early years. Like all good yarns about life, Ritesh Batra’s film contains a complex, very emotional, intriguing script that keeps you guessing. It’s a fine piece of British drama with superb performances by all the characters, especially Broadbent, who never fails to impress. Rampling, too, delivers a solid, if somewhat arch portrayal of a woman who’s lived her life embittered by the past and who is not ready to forgive, or indeed forget. This is a stark reminder that if you carry your baggage with you, life can become a trial and not a cause for celebration. The Sense Of An Ending is at times painful to watch but it’s the sort of film that will have you thinking about your own life and actions for days afterwards.